The sea is considered to be a lullaby of civilization - not without a reason the most developed nations of antiquity always lived nearby with water expansions. The underwater world has always attracted and amazed people. Oceanic and sea depths keep in themselves a lot of mysteries, tempting a curious person. And now when not every person can go to a sea, we have an opportunity to see a piece of the underwater world in our city. For this purpose exist dolphinariums and oceanariums. Holidays continue as an endless procession and the problem of gift choice for another celebration arises more intensely. Moreover, it always feels like choosing an original and unique gift. What to do if the chase for gifts finishes not to your credit? In this case you will have to remember, that today are fashionable not standard and creative solutions. Make your choice with the help of certificates, which today are considered to be the most original gifts. We used that a gift it is usually a thing. Gift certificates totally chage the traditional representation about presents. With any thing, even the most exotic with time you will feel bored, or it will uselessly stay in dust on the shelf. The absolutely different approach works with the choice of the gift certificate as a present. Here you give not a thing, but an impression, adventure or any event. In our life emotions are much more important than things. In particular because of this gift certificate is an ideal choice. With the help of gift certificate your close or beloved person, relative or friend will be able to try incredible adventures and get a lot of positive emotions. By giving gift certificate as a present, you will be able to turn into reality the most extravagant holiday ideas. Gift Certificate - is a source of ideas for original and exclusive gifts. Nowadays are very popular gifts-impressions, which reveal the gift certificates. Gift Certificate – is not just the original gift, it is a set of impressions. Gift certificates - are more than just a sign of attention. Gift certificate - is an ideal love expression, the best compliment, uneclipsed feelings, special drive and new peaks. All the adventures, which include gift certificates are absolutely safe, as nearby with you will be professional instructors. The gift certificate can be chosen with account of the suggested interest and age of those, to whom the certificate is intended. Gift Certificate will become a splendid gift for relatives and friends on the birthdays. The universal and excellent gift for every person will become gift certificate for swimming with the dolphins, as such an adventure will give a lot of positive emotions and unforgettable impressions. 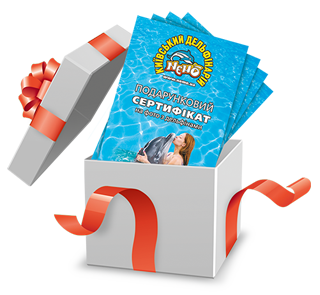 Versatile and the perfect gift for any person will become gift certificate for swimming with dolphins, as this kind of gift will bring a sea of positive emotions and unforgettable impressions. Diving, swimming and communication with dolphins — it is specially organized program when You are just staying in the water with dolphins and feel yourself in the role of coach. After a five-minute briefing You will go down into the water. Dolphins will play with You, roll over the fins on bellies, dance waltz with You just as on the performances with the coaches. Friends and relatives will be able to make photos and shoot video. Swimming takes place in bathing suits, if necessary, the trainer can provide You with a wetsuit in Your size. Children are provided with sleeves or vests. Children under 5 years and pregnant women are not allowed for swimming! Photo with dolphins is a great opportunity to capture on film the touching moment of the meeting with unique animals — dolphins! This is one of the best gifts that will appeal to both the child an adult, it's emotions and memory for life! Take a picture with our wonderful artists — dolphins — after the presentation on the platform or in the water! 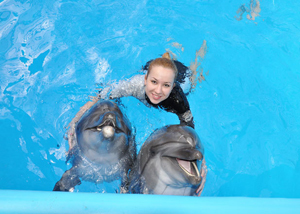 Photo with dolphins at the platform — You will be on the stage, the dolphins will come to You. You will be able to Pat them and get a vivid photo on the memory. 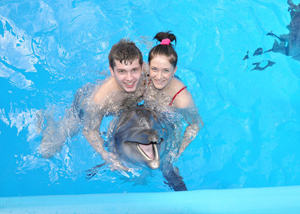 Photos with dolphins in the water — the dolphin will substitute its fins, swim with You 1 big circle around the perimeter of the pool, our photographer will take a picture of You and the gift You will receive a photo large size (A4 format). Photographing with the dolphins will leave in the memory unforgettable positive emotions from communicating with these amazing marine animals. Diving with dolphins is a dive with a full set of equipment and with an experienced instructor under water to the dolphins. In the Dolphinarium You will be greeted by experienced diving instructors, who will select and give You a set of equipment for diving will conduct briefings and will drop You water where You will spend 30 unforgettable minutes with dolphins. Allowed to dive everyone aged 9 to 50 years (after consultation with the diver). We not only present you with an unforgettable experience, but also take care of your health! 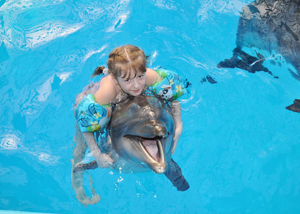 Dolphin - is a specially designed health program for you and your children. Dolphins doctors cautiously and carefully will communicate, play with you and, of course, will give real pleasure of riding on the waves of our swimming pool. Friends and loved ones at this point you can take pictures and shoot video. Classes are held every day except Sunday (holiday). Writes the classes necessary to advance to the desired date (not less than 14 days). dolphin Department reserves the right to transfer the lessons in case of unforeseen circumstances that prevent their implementation. Duration reduced by the amount of time that a person is late. The money is not returned if the person in advance (at least for a day) has not informed the administration of his absence during the lesson. The certificate is valid only if the ticket. Ticket for the exchange of dolphin therapy and non-refundable.